The Mom of OZ: My Life in Words, Part Ten: The last time he would smell fresh air. My Life in Words, Part Ten: The last time he would smell fresh air. On Christmas Day, mom said "I wrote for you." The story continues, Starting here, Part nine here. To say that I craved sleeping with someone sounds so calm. Maybe I need all caps in this case. I CRAVED SLEEPING WITH SOMEONE. As a reminder, my grandfather was gone most nights, as he worked out in the Gulf of Mexico on an oil rig. So for most of my childhood, I lived in a house of females. My grandmother, my aunt, my mother, and me. When my mother wasn’t available, I would sleep with someone else. 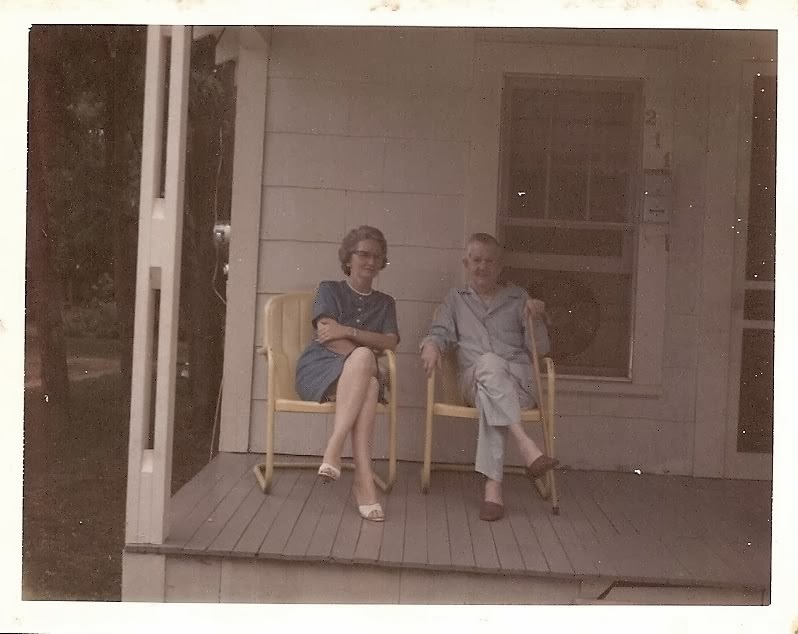 No one turned me down – except for Pa-Paw. When he would come home, he wanted to sleep with his wife without a child between them. Took me years to understand that! The people in my life were not dreamers, or artists, or poets. They were workers. Nope.. I didn’t wake up my mother for my school preparations. That was Me-Maw’s job. I am quite sure that many princesses didn’t have it as good as I did growing up. By the time my eyes saw the sunlight of the morning, everything that could be ready, was ready. My dress was laid out, my breakfast on the table, my satchel by the front door. Bookbags weren’t invented yet. I had a little childlike briefcase with cheap plastic straps secured by cheap metal buckles. I went through several each school year because I tended to be rather rough on them. Breakfast was the breakfast most kids are unaware of today, unless they go out to I-Hop for breakfast on special occasions. There was meat (bacon or ham, but most definitely pork), eggs, toast, jelly. Sometimes it would be grits. But none of that instant stuff – grits cooked on the stove where I would stand transfixed watching them. I had a great imagination and I saw them as lava, pulling up into big bubbles until they would pop, sending little pieces of corn meal up inches into the air. I wouldn’t really see lava in real life until I was in my late thirties on a trip to Hawaii. And my thought was how much its thickness resembled the grits of my childhood. I didn’t share that with anyone, however. I didn’t want to be seen as different. The people in my life were not dreamers, or artists, or poets. They were workers. This is not to say that everyday workers are not artists, it simply means that the mediums they work in are the consumables of our lives. A farmer grows what he considers to be a perfect squash, but he doesn’t indulge himself with idolizing it or attributing praise to it. He simply looks at it, thinks to himself how grand it is, then drops it into the bushel with other squash to one day be fried up with butter and onions by another artist whose work is admired by those who eat that perfect squash. Each artist in that cycle is anonymous to the next, but it doesn’t make it any less beautiful a process. My grandmother came from a long line of farmers. She was the first daughter in a family of four boys and two girls. For the majority of her life, she was the only daughter. My great grandparents were Ben and Lizzie Watters. In talking about my life, I always think of it as a clock that is consistently one hour – in my case, one generation – off. My grandmother was my mother, my great grandmother was my grandmother, and that leaves my mother as….. well, I really don’t have a good answer for that one. The closest thing would be to say that my mother was like a sister to me. I said that to her once and she didn’t speak to me for a year. But that drama came many years later than the point we are in this story. Neither of us imbued any deep philosophical meaning into those conversations. We were just friends. Ben and Lizzie were definitely farmers. One step above indentured servants to be exact. They were share croppers. While they did own some land in “the bottom” as it was known, and made memories there, they generally made money farming land belonging to someone else – someone richer. I never heard the words poor, or poverty, or needy, or any other synonym we call it now. They were just “plain folks” who got up each morning, gathered eggs, tended fields, and raised children. By the time I was old enough to start building my memories, their working farm days were over. They had moved to “the city.” And to call Springhill, Louisiana the city was to acknowledge how small was the universe of Ben and Lizzie. It would be difficult to find two people more diverse than this couple. While he was a small man, standing only about 5’6’’, she was a tall woman, probably 5” 9”. My grandmother claimed an English ancestry for her father, but he always looked to me like those described as “black Irish” in that he had dark hair, blue eyes, and fair complexion. He was an oddity, that his hair never fully turned gray, but kept its dark appearance even at his death in his mid 80s. Lizzie on the other hand, turned gray very early in life, then when most others are turning gray her hair became white. WHITE. Not grayish white, or silver, but white. It was beautiful, and she was known as a beautiful woman. As expected, few pictures remain of her, but those that do show a strikingly beautiful young woman, and it is easy for me to romanticize her relationship with Ben. When they married, he was 32 and she was a mere 16. At that early age, she was an orphan. Her mother, my great great grandmother was often called a “black widow”. She died in her early 30s and left her fourth husband with a young child. Lizzie’s father was a Newberry and she had many cousins in the southern Arkansas/north Louisiana area. Ben was known as an honest man and his daughter, my grandmother described him in almost angelic terms, saying that he was the kindest person she had ever known. I can only say that he was kind and loving to me. He was the rare adult who treated me almost as an equal. I spent much of my summers as a young child with my great grandparents in Springhill where I was allowed to do the things that short stories are made of. Paw-Paw Watters and I planted a field of summer squash. We would walk every afternoon to feed and walk Buck, his horse around. We fished. And we talked. Long long walks and long long talks. I wish I could say that I remember those talks, but I think the beauty of them is that I don’t. They were simply mundane conversations that two friends may share. Maybe it was the weather, maybe it was the crops. Neither of us imbued any deep philosophical meaning into those conversations. We were just friends. When I was eight-ish, he had a stroke. It was a terrifying time for me. I didn’t understand what a stroke meant. Didn’t know what it was. When I tried to ask, I was shushed and when I wasn’t shushed, my Me-Maw would cry. I learned not to ask, but went back to my tried and true routine of simply listening for those snippets of information which I could piece together into some fabric of understanding. What I didn’t know at the time was that my life with my Paw Paw was forever changed. No more walks. No more Buck. No more talks. Just PawPaw in a hospital bed in the middle bedroom. As the days went into weeks, the weeks turned into months, then years. He laid in that bed for close to four years until he died the summer of my twelfth year. So now my memories are mostly of rubbing his feet with lotion, and combing his hair, and singing to him at the request of Me-Maw. On one of our visits, she got him up and put a robe over his pajamas. She walked him out to the porch where he enjoyed his last visit outside. A dear neighbor, Lee Martin, came over to visit with the family on the porch. Pictures were taken. Many in the family probably still have an enlargement of that picture in their home. I used to look at it and wonder if he knew it was the last time he would smell fresh air, see the sky, or visit with friends while sitting face to face with them. The rest of his days everything he saw, felt, or sensed was from a prone position. That makes me sad.